There really is no way to describe the true thrill of what we experienced in our Spartan race. I am going to try though because it was just too awesome to not share. 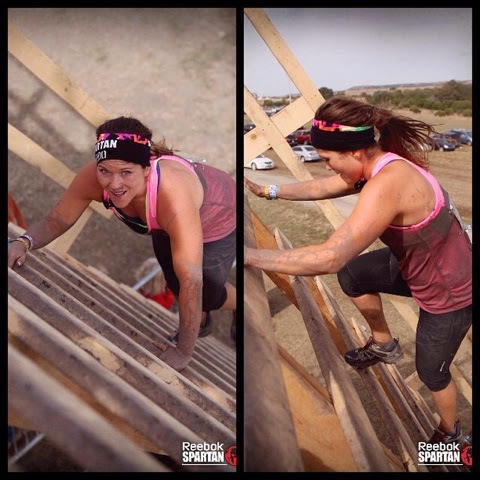 When you fail an obstacle on the Spartan you have to do 30 burpees before you can move on. I failed the rope climb(shocking, I know), the side wall climb and the spear throw....leaving me with 90 super fun(insert sarcastic smiley here) burpees! My husband was so sweet to wait for me at obstacles to help me over walls if I needed it. If it weren't for him I would have done even more burpees! You can't notice in any of my pictures because my shirt is covered in mud but I was wearing my 2 Timothy 1:7 shirts that says "POWER, LOVE, SELF DISCIPLINE". There were a few times during the race that I started thinking I couldn't go on and the Lord reminded me of that scripture. He reminded me that he made me strong and powerful, not weak and timid. Like I mentioned, I had the word written on my shirt to remind me of who I am in Christ. Do you need to have a shirt made for everything you do? No. But you do need to have it hidden in your heart so you can easily remember it in tough times that you want to quit. The other really cool thing about the Spartan race was how everyone helped each other regardless of knowing one another before the race. I was amazed to see random strangers staying behind to make sure everyone made it over a wall or stopping to help me up when I fell. It reminded me that we need to surround ourselves with people who are working towards a common goal and who believe in what we are doing and will not let us quit. Ecclesiastes 4:9 says "two people are better off than one, for they can help each other succeed." When the day of the race came I knew I had done everything in my power to train for this. As I was running I had to tell myself more than once "I am prepared for this. My body is equipped for this." I think the same thing is true spiritually. Read the word and spend time with God in worship and prayer and when your race day comes you can easily remind yourself that you are equipped for this. In our go, go, go! society it can be easy to not stop and give God thanks for things He has helped us to accomplish. 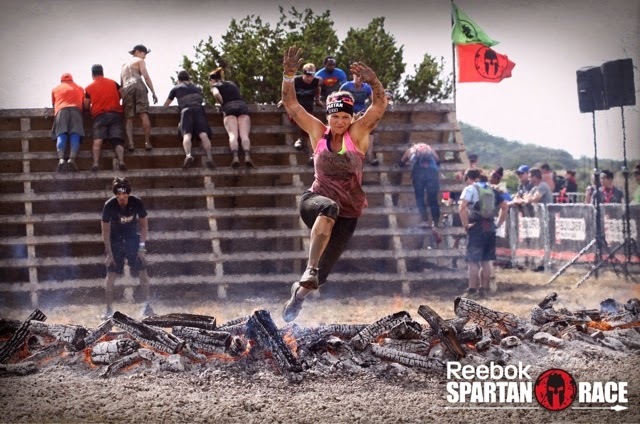 It was such an amazing feeling to do our last obstacle, the fire jump, and run through that finish line! 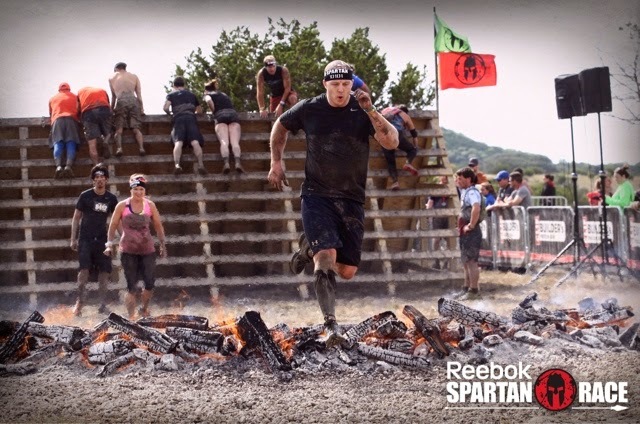 If you have nothing holding you back physically from doing a Spartan I highly recommend kicking fear to the curb and going for it. 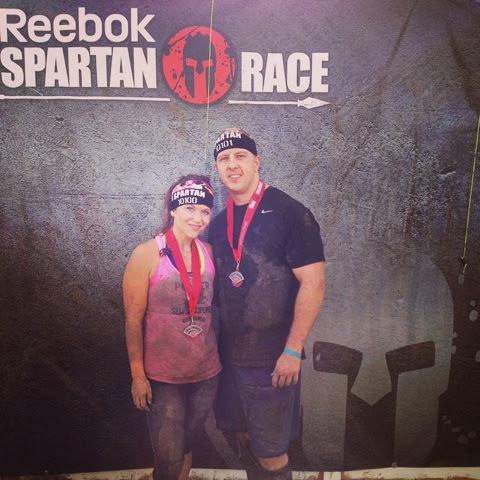 My husband is now trying to talk me into running the Spartan Beast(which is more obstacles plus 12 miles). I just love surrounding myself with people who challenge me. Who does that for you? Find someone who does or read my blog and let it challenge you! I know not everyone is physically able to do a Spartan race but what is God calling you to do that may seem a little scary or uncomfortable? Pray about it, train for it and then do it. It will be so worth it! You are so inspiring my friend, well done!